Death's Scythe artwork from Ultimate. Death's Scythe (死神の鎌, Death God's Sickle) is an item that appears in Super Smash Bros. Ultimate for the Nintendo Switch. It was revealed in the August 8 Nintendo Direct. Soma Cruz using Death's Scythe in Castlevania: Dawn of Sorrow. 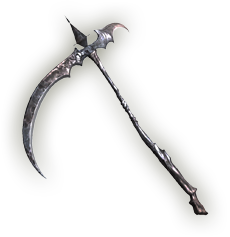 Death's Scythe is, as the name implies, the weapon that accompanies Death in the Castlevania series. It is said to reap souls from those it slashes, and can sometimes even be used by the playable characters; it is usually considered one of the most powerful weapons of the series. In real life and other forms of media (including books, cartoons, and other video games), the personification of Death (or, as it is more commonly known, the Grim Reaper) is usually depicted with a scythe as its primary weapon and tool in order to gather souls from those who have passed on. Death's Scythe is a battering item which the user swings in an arc ahead of them. While the swing is readied, opponents whose damage is at or above 70% hit with the tip of a smash attack will be surrounded by a darkness effect, at 69% or less if hit with any part of the death scythe the blade of the scythe will have a red effect. hitting such a heavily damaged opponent with the Death Scythe during a smash attack, or even a tilt attack if their damage is at or above 120%, will instantly KO them. Characters KO'd in this manner do not take knockback, and instead simply vanish in a puff of smoke. Equipping the Antasma, Mimikyu, Nash or Hector (Castlevania) Support Spirits will give the player a Death's Scythe at a start of a match. Death with his Scythe from Lament of Innocence, the basis for its design in Ultimate. Ness instantly KOs Bowser Jr. and Bowser with Death's Scythe. The inclusion of this item marks the second occurance of a signature item of a particular character appearing as an ordinary item in the Super Smash Bros. series, the first being the Lip's Stick. Unlike the Lip's Stick, other characters besides Death have used Death's Scythe in Castlevania. Death debuted in the same game as his weapon in the Smash series as a background character with Death's Scythe in the Castlevania stage. Lip, however debuted in Ultimate as an Assist Spirit which was three subsequent installments later then when her weapon debuted. (while a Sticker named "Flower Fairy Lip" appears in Super Smash Bros. Brawl, the character on the Sticker is actually Furil from Nintendo Puzzle Collection, a similar-looking but distinct character). Death’s Scythe is the first third-party item (that isn't character generated in their moveset, such as Snake's Hand Grenade, Mega Man's Metal Blade, and Pac-Man's Bonus Fruit) to come from a series represented with a playable character. If the Death's Scythe KOs a buried character, the "Special Zoom" effect will occur twice. This page was last edited on April 17, 2019, at 23:37.